You've made the decision to send your child to camp, which will allow for your child to participate in a myriad of new activities and to build life skills that are not taught in the classroom such as independence, self-confidence, and resiliency. There are many camps from which to choose, but what should you consider when sorting through the choices? 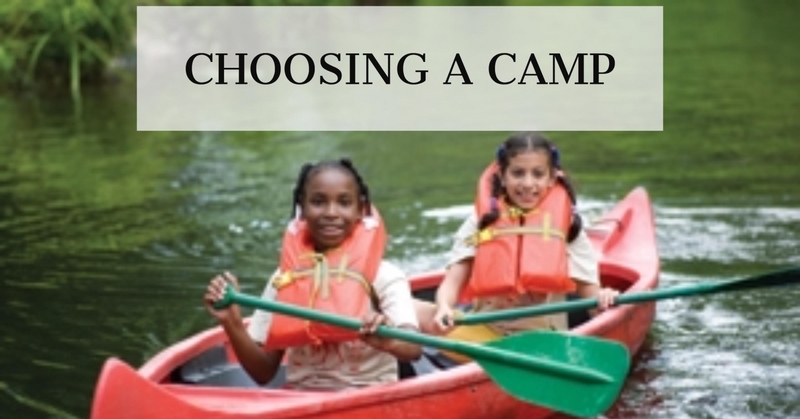 Here are just a few things to think about when deciding on a summer camp. Each camp has its own mission and philosophy, so it's important for you to do your research and find a camp that matches your own family's values. Consider your child's personality and learning style when looking into a camp's mission and philosophy, and make sure it's a good fit. While you should certainly consider facilities and activities at a camp, clicking with the camp director is very important. When you choose a camp, you are forming a partnership with the director, so you want to make sure you feel comfortable with her. Schedule a camp tour that will allow you to see the camp while also giving you time to talk to the director. Get to know the camp director through phone calls, e-mails, a scheduled home visit, or at a camp fair. When speaking with the director, ask questions about the camp program, staff hiring, safety procedures, and what type of child is successful at the camp. Although some camps have programs for children even younger, day camps are designed for children ages 3 and older. For many children, day camp is the first experience toward independence, and it plays an important part in their growth and development. Children can go to sleepaway camp beginning at age 7. Keep in mind that just because a child is a certain age, it doesn't mean she's ready for sleepaway camp. If you are considering sleepaway camp, you want to be sure your child has had a number of successful overnights away from home, is mature enough to go away for an extended period of time, and is able to do certain things independently such as brushing her teeth and showering. Specialty camps focus on a specific camp activity or related camp activities for a given period of time, while traditional summer camps offer campers exposure to a whole range of activities, as well as a social and developmental experience. Consider your child's age when choosing between a traditional and specialty camp. Young children often haven't figured out their interests, and a traditional camp exposes them to a whole range of activities to develop many different skills. Older children and teenagers often show a particular interest in a sport or skill. A specialty camp may be a good option for them to hone these skills. Families should also know that many traditional camps offer focused programs where a camper can specialize in a chosen activity. Often times, these activities are taught by top athletic coaches, so children receive first-rate instruction in that activity or sport while also enjoying other aspects of a traditional camp. If you need assistance in finding the right camp for your child, the American Camp Association, New York and New Jersey, offers free, one-on-one advice in finding the right camp for your child. Parents can call (212)391-5208 or visit www.searchforacamp.org. Both day and sleepaway camps offer different session lengths for your family's needs. Children can go to camp for a few weeks or for the whole summer. Some day camps offer "mini days," allowing the youngest children the opportunity to go to camp for a few hours a day or for a few days a week. Full-session sleepaway camps are traditionally seven weeks and give campers more time to adjust to camp and become ingrained in the community. A short-session camp is held for a few weeks and provides campers with a specific beginning, middle, and end time. Campers in each session arrive and leave together, making it easy to form friendships. Don't be afraid to ask a camp for references. This is generally one of the best ways to check a camp's reputation and service record. You also want to make sure the camp is inspected each summer by the Department of Health and ask if the camp is American Camp Association Accredited. The ACA is the only national organization that establishes uniform standards for reviewing a camp.